We have come to drag days: Mush You Huskies, Mush! "so, a story about what you do at 20 below - if you're me, you put on about 7 layers of wool, polypropolene, and polar fleece, and head outside to "put in a dog lot". Race season is upon us - when after 3 months of winter, these f'ing cabin-fever crazed citizens will race just about anything over the snow - snowmobiles, dogs, skis, bikes, outhouses (yeah, that's not a joke). We've been a host/checkpoint for a few different races the past few years, but two have been consistent : the Susitna 100 and the Jr. Iditarod. The Jr. Iditarod is fairly self explanatory, it's a dog-mushing race for teens (14-17) who run their own teams, completly self-sufficent over a 100 mile course (we're the halfway point). It's a pretty cool thing. The Susitna 100 happens a few weeks earlier,(Feb 14th this year), and it's much nuttier. It is a "human powered" race - meaning you can ski, bike, or snowshoe the race - which is 100 miles, all wilderness trails. 100 f'ing miles - completly on your own, through some absolutly frozen, desolate landscape. These people are total nut-jobs. We're the halfway point for this as well, and there is some serious comedy as shell-shocked bodies start rolling in. But back to the dog lot - it's needed for the Jr. Iditarod, so that racers can rest their teams, and any injured dogs can be checked out by a vet, dropped off, flown back into town, etc. 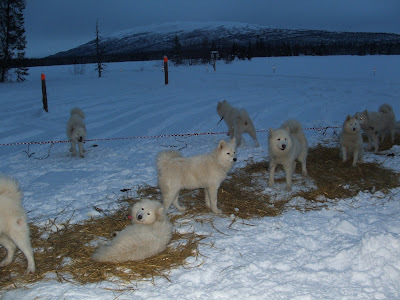 We also have a lot of adult mushers who come out for weekends to do practice runs for their teams, stay overnight, etc. I knew practically nothing about dog-mushing before I came up here - not that I know all that much now - but I am amazed at how much care these people take with their animals. So, "putting in a dog lot" consists of first finding where you stashed the dozen posts you used last year (these are wood, about 8 feet long, 6-8" in diameter). After you realize they are against the back of the tool-shop with about 6 feet of snow up against them, you take half an hour to shovel them out and move them out onto the frozen lake, into a couple hundred foot oval area that you've previously spent an hour packing down with a snowmobile. You then take a chainsaw and cut two foot deep holes in the ice to drop the posts into, each about 20 feet apart. pack the holes back in, connect some strong chain between them for people to hook their teams up to, let it freeze ovenight and bingo, there's a dog lot. all while it's about -22 degres out. my life is ludicrous. but, it's worth it, as happy doggies are the result - the attached photo is an "action shot" from 2008's dog lot." He may as well have just written 2,000 words on being from another planet in another galaxy. That's how little I can identify with what he had to do that morning. Just the part about digging out the wooden posts exhausted me.